Ryco docks were designed to be used in residential style areas. They feature a lightweight aluminum frame and is modular to create the desired dock layout. Easy install aluminum and plastic deck panels simply slide into place and fasten with just a small pin in the matter of seconds. 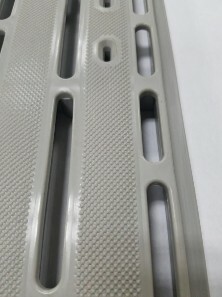 The design features allow the end user to install these sections in numerous different configurations, yet still be strong enough to take on strong storms and high wake situations. Our rigid square tube telescopic dock leg design allows the user to adjust the height of the dock by simply standing on the top of the unit. No need to get into the water to adjust! 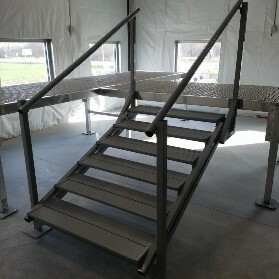 This all aluminum dock can be used in many different applications. Simply add your accessories like an easy install wheel kit, dock bumpers, benches, and water steps to complete your dream dock arrangement! 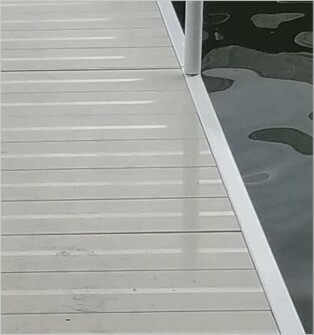 The primary Ryco Dock decking panels feature a rib style aluminum extrusion that provides the unique strength of steel but in a lightweight aluminum version. 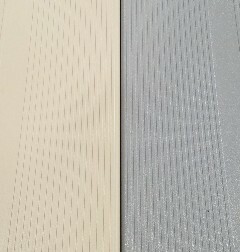 Combine this rib style panel with a texture powder coat finish of your choice to form the most anti-slip and rigid panel design on the market. Available in gray or special order tan. Ryco Dock offers a high quality plastic decking manufactured by Titan Decking. Made of 100% polypropylene plastic, Titan decking will never rot, warp, dent, splinter or bend and never needs painting or staining. It’s UV protected, barefoot friendly decking that stays cool to the touch even in extreme temperatures. Available in gray. Special Order. Complete your dream dock with distinctive, useful, or just plain fun custom accessories. Ryco Dock has a full line of accessories to meet any of your needs. 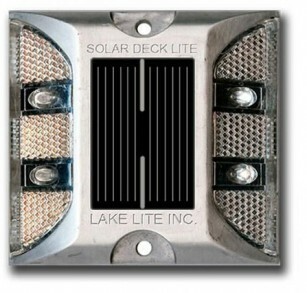 Light the perimeter of your dock with these low profile solar path lights. All of our Ryco docks come with Screw Adjustable Legs. 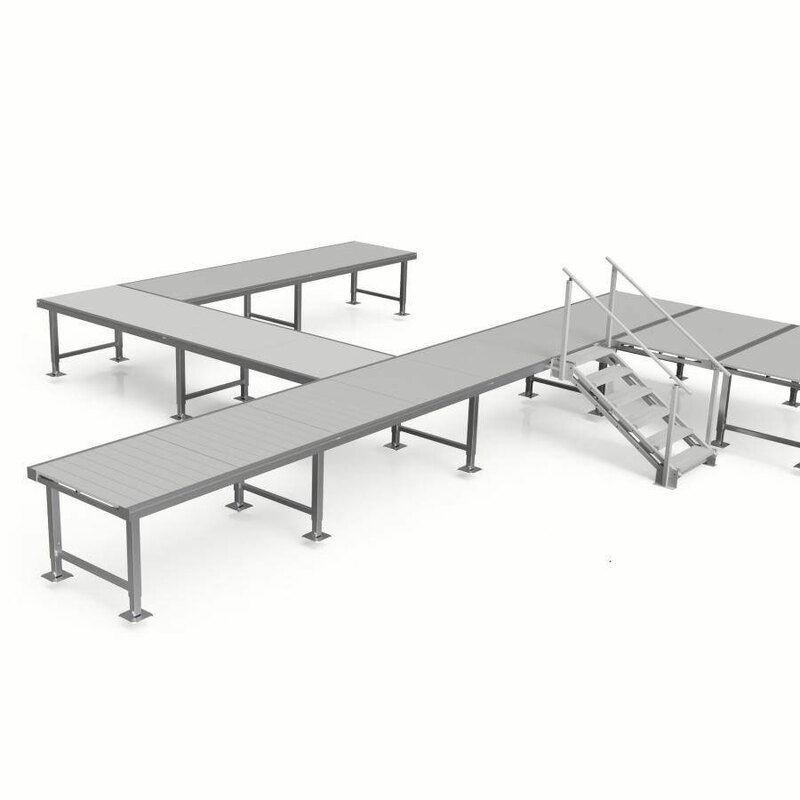 Our rigid square tube telescopic dock leg design allows the user to adjust the height of the dock by simply standing on the top of the unit. No need to get into the water to adjust! 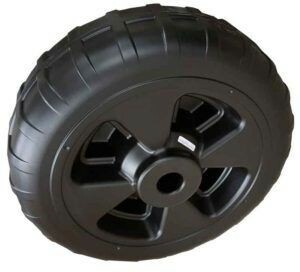 Dock wheels can be added to any Ryco dock in the matter of minutes. These dock wheel kits provide excellent stability in water depth of up to 7ft, and make the ease of installation and removal a breeze. When used on a Ryco dock, you can adjust the height of the dock without entering the water. Ryco Dock offers a vertical style dock bumper. Don't allow your boat or watercraft to sustain any damage using these easy to add bumpers that install in seconds and are fully adjustable along the dock side rails. Add style and comfort to your shoreline with these dock benches. 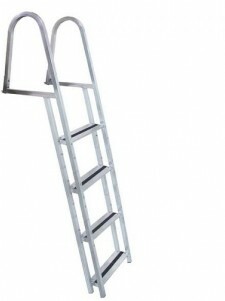 Durable, lightweight anodized aluminum ladder that can be added to your Ryco Dock in minutes. 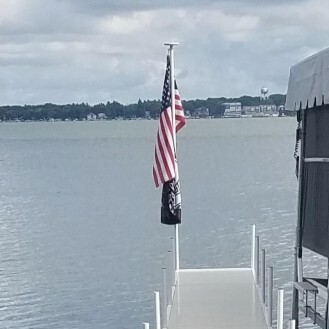 Customize your Ryco Dock with a clean looking flag pole and flag pole holder. Includes a 3' x 5" American Flag. Ryco Customs, LLC (hereinafter referred to as “Manufacturer”) provides a limited warranty for Ryco Dock Mfg. to the original purchaser (herein after referred to as “Purchaser”) of the product or a component of a finished product if produced by a manufacturer approved by Ryco Customs, LLC. Ryco Dock Mfg. 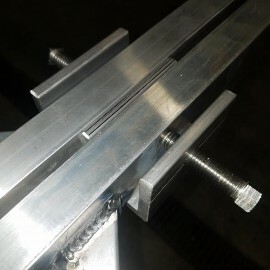 aluminum section TIG and MIG welded connections will not crack or break, due to standard use of this marine style product, excluding the case of any natural disaster or misuse of specified product. Manufacturer will, within two (2) years from the date of purchase, upon receipt of a proper claim including original purchase invoice, will either replace the defective parts or, at Manufacturer’s election, issue a full credit for the purchase price to be used for future products purchased of Ryco Dock Mfg. For the ten (15) year period commencing with the third year following the date of purchase, the warranty will decrease by 9% per year starting at 90% in the third year. This percentage change will be applied to the amount of replacement product supplied at Ryco Customs, LLC then-current price or to the credit, as elected by Manufacturer. THE SUCCESSFUL PERFORMANCE OF RYCO DOCK MFG. IS HIGHLY DEPENDENT UPON MANY FACTORS BEYOND THE CONTROL OF THE MANUFACTURER. THEREFORE, EXCEPT FOR THE REPLACEMENT OR REFUND CREDIT, MANUFACTURER MAKES NO WARRANTY OR GUARANTEE, EXPRESS OR IMPLIED, INCLUDING NO WARRANTY OF FITNESS FOR A PARTICULAR PURPOSE; NO WARRANTY OF DESIGN CAPABILITY; AND/ OR NO WARRANTY OF MERCHANTABILITY REGARDING ITS PRODUCTS, ALL OF WHICH WARRANTIES ARE SPECIFICALLY DISCLAIMED. Under no circumstances shall Ryco Customs, LLC be liable for special, incidental, consequential, exemplary or punitive damages including, but not limited to having no liability for damages for personal injury, loss of life, property damage, damage to or loss of product, loss of profits and/ or loss of revenue. The price at which the product is supplied to a Purchaser is in consideration of the limiting of Manufacturer’s liability and the Purchaser’s remedies. 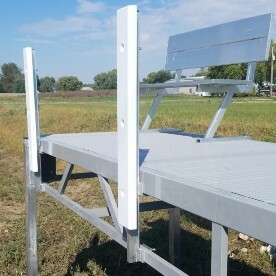 The limited Warranty does not cover the use or misuse of any mounting hardware, connections E-channel brackets, nut inserts, or any other hardware used to connect leg units or accessories to a Ryco Dock Mfg. product. Under no circumstances shall Ryco Dock Mfg. be liable for any misuse of screw jack style leg adjustment assemblies on either A5000 or A7000 Series dock units. These leg units are designed for use with manual operation Ryco Tool Part #T57-900 for adjustment. Warranty will be VOIDED if any electric or battery style tools with associated socket are used to adjust these leg assemblies. Consumer/ Dealer will be responsible for replacement parts needed due to the misuse of this assemblies. Routine maintenance and checking for loose connections or damaged parts must be performed on a monthly basis. Ryco Dock, Mfg. shall not warranty and cover damage caused by circumstances outside the reasonable control of Ryco Dock, Mfg., including but not limited to, improper use, misuse, abuse, improper installation, overloading, accident, neglect or harmful alteration or repairs made by others, damage by snow or ice, electrolysis, corrosion, natural expansion or contraction of parts or products caused by weather conditions, severe weather conditions, terrorism or acts of God. IF YOU ATTEMPT TO REPAIR OR REPLACE PARTS OR PRODUCTS WITHOUT THE AUTHORIZED WRITTEN CONSENT OF RYCO DOCK MFG. OR USE ANY UNAUTHORIZED METHODOLOGY OF REPAIR OR IF YOU ALTER, MODIFY OR CHANGE THE PARTS OR PRODUCTS YOU WILL VOID THIS LIMITED WARRANTY. Manufacturer limits its Warranty for a proven defective product to replacement or credit against further purchases in accordance with this Warranty document. All information and data provided at the time information is supplied by Manufacturer is believed to be accurate and complete. However, all information is provided without any guarantee or responsibility of any kind, expressed or implied. Suggestions or statements concerning possible use of products are made without representation that any such use is free from patent infringement and is not a recommendation to infringe upon any patent. The user must be aware that there are or may be safety measures that are required in the use of the product which are not stated herein. Manufacturer must be given an opportunity to inspect all of the Ryco Dock Mfg. products claimed to be defective or damaged for which application is made under the terms of this limited Warranty. Ryco Customs, LLC must determine that the Ryco Dock™ product is defective and covered by this limited Warranty. If Manufacturer determines it is going to replace the product on a full – replacement or prorated basis, Manufacturer will deliver the repaired or replacement product to the original Purchase at the original site of delivery, or such other locations as the parties may agree upon. Installation and reinstallation are at Purchaser’s expense. Manufacturer will not be liable for any installation or reinstallation costs. 02/17/16 – Ryco Customs, LLC. Ryco docks can be configured to meet the most demanding needs. 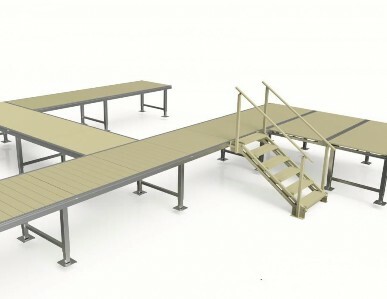 The general shape of your dock is an important factor when deciding the components necessary. There are many ways to set up your dock. You can have a simple straight dock, a patio dock, or an “L” dock. You can also create slips with your layout. The image below has each of these elements included. Can I do a rolling dock? Ryco docks can be configured to meet any of your needs. Rolling docks are no problem. Each Ryco frame section (4’x8’) can have wheels added to them. We do not connect frames together to make longer sections, instead we simply install wheels on each dock frame. This allows each dock section to be as light as possible and is easier to install and remove. We have wheel axle assemblies that can be added directly to our leg sets. Two axles and two wheels are all that is necessary to complete the system. The length of your dock is going to be dependant on your needs. If you are using a boat lift, you will want your dock to be long enough to reach at least three feet of water depth. If you are not using a boat lift, water depth of two feet is typically sufficient. What about my lake bottom? The most common lake bottoms are going to be sand, muck and rock. Ryco docks can be used on any of these surfaces. Sandy bottoms are the best and require no special provisions to set a Ryco dock. Rocky bottoms typically require little additional work to set. Mucky bottoms are the least desirable bottom type for setting any dock. You may need extra large “Muck Pads” to give you more surface area to try to support the dock on top of the muck. You can also let the dock legs settle through the muck if the depth of the muck is not too deep. If this method is used, the depth of the muck must be added to the water depth when determining your overall dock leg height. Any dock that is installed in muck will pose additional challenges when removing and installing seasonally. Ryco docks should be positioned out of the water about 12”-16” from the top of the water to the top of the dock. This will of course be dependant on water fluctuation. If you live in an area with large wave action or water fluctuation, you will want the dock positioned higher to avoid damage to the dock. What height leg sets are included with a Ryco dock? Ryco dock frames are purchased separately from the decking or the leg sets. You need to choose your leg set height based upon your total depth. Total depth would be your water depth plus the depth of any muck you may have plus the height you desire the dock to be above the water. In the example above, the desired leg set would be the 48”-72” leg set. This is just one of the leg sets needed. Likely you will need several different heights of legs as your water depth will vary from shoreline to the end of the dock. These measurements should be taken every 8’ from the starting point of the dock as our dock frames are 8’ long each. How much does a Ryco dock weigh? The Ryco dock frame weighs about 48 lbs. 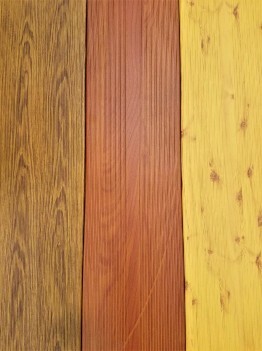 Decking panels weigh about 30 lbs each.Leg sets weigh from 23 lbs to 48 lbs depending on leg height. Most Ryco dock sections weigh 137 lbs complete with decking and leg set. With the decking removed it would weigh 77 lbs for installation and removal..
Ryco docks are among the easiest to install and remove. The decking can be removed to reduce the weight of the dock sections. This is particularly helpful when removing or installing the dock yourself. Ryco’s quick attaching system makes separating dock sections a breeze. Simply turn the pinch screws a couple of turns and lift the dock section out. Stainless steel hardware ensures that the pinch bolts will not rust or freeze up. Ryco’s screw adjustable leg sets make leg adjustments hassle free. Turn the screws from the top of the dock to achieve the desired height. You can even make adjustments without getting wet! Always consult a professional dock installer if you have any doubts about removing or installing your dock by yourself. There are many companies that provide seasonal dock installation and removal services. Whether you configure your Ryco dock as a stationary or rolling dock, the off season storage is generally the same. The decking should be removed from the dock, stacked up and covered. The dock frames are then stacked on the shoreline. Wheeled sections typically are set side by side as they don’t tend to stack as well as stationary sections. We sell our products as assembled and installed units, unassembled delivered, unassembled picked up, or unassembled drop shipped. The cost of the docks and accessories is the same whether you want it assembled, delivered, shipped, or pick it up yourself. Professional assembly and installation is available for about $125 per 8’ section. Accessories do not have an additional assembly or installation fee when purchased with a dock. Delivery for assembled products is included for local customers. A small delivery fee may be necessary for non-local customers. Unassembled products can be delivered on our usual routes or drop shipped from our manufacturer. Please contact us for more information about delivery of unassembled products. Assembled and Installed- This type of purchase is where we handle the entire process for you. You tell us what you want and we deliver it, assemble it, and install it at your location. 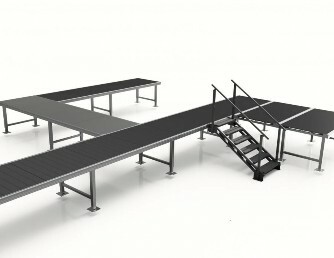 The dock and accessories costs the same but we charge you for the delivery, assembly and installation. This fee is usually around $125 per section. Having us install your dock for you ensures that you will have a fully functioning product that was handled by dock professionals. We have the tools and expertise to make sure your dock is straight and level and up to your satisfaction. Use our product price list to help determine the cost of your new dock. Also, pictures are attached to each item so you can determine what products are best for your application. How easy is it to assemble a Ryco dock? Most Ryco dock frames are ready to install in the water in five minutes.